This is the house to spend a wonderful stay in San Miguel de Allende. 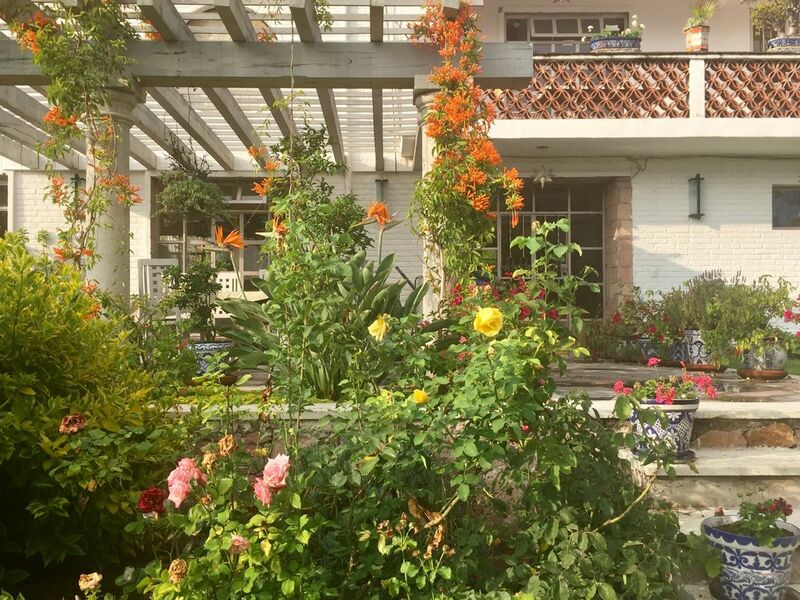 If you love sun, beautiful gardens, sunset views of the town and mountains and outdoor dining overlooking a large flower filled garden with hummingbirds this is the place for you. The large garden- lush with bouganvilleas, fruit trees and scented with jasmine, has a large patio loggia with outdoor eating area, outdoor dining table and seating for 10. There are many birds which come into the garden, including green hummingbirds. Big lawn for kids to run around in. Multiple areas to relax in lounge chairs in sun or shade. The pergola over the seating area has a lovely wall fountain and overlooks the gorgeous garden with view of the parroquia. The home is designed and built by a well known artist family, has wonderful details, with original tasteful artwork is in every room. The lush, flower covered gardens and patios, the 2 story wood beamed -ceiling dining room with spectacular stained glass windows and solid onyx floors, the comfortable living room, the large kitchen, the comforts of the 4 well-appointed bedrooms, bathrooms, the spectacular panoramic views, multiple terraces, and original art work, will make you feel warmly welcomed. You can have breakfast as you sit on the pergola patio overlooking the walled garden filled with climbing bougainvillea, lavender and lemon trees or have coffee on your private upstairs terrace. Enjoy watching is the sunset or relax with cocktails on the terrace. In the evening, you will see the churches light up, flocks of birds flying in for the night and the hillsides reflect the glow of the sun with a spectacular view of the town and string of churches. You can enjoy the warm sun or lunch under a shaded area furnished with tables and chairs. From the master bedroom, look out to the garden. On nights with a slight chill, light the fireplace in the bedroom or living room with high ceilings with authentic beams throughout. Relax in the living room, which opens onto the garden. The ground floor patio is furnished with table and chairs for outdoor dining, or dine indoors in the high-ceiling (double height with beams) dining room with glass "chihuly" chandelier. The double height dining area has original stained glass windows high up and beamed ceilings. It overlooks the garden and opens to the terrace. The house has all the room and conveniences you need. There is a master bedroom suite with king-size bed with comforter and pillows and fireplace. The large master marble bathroom with sunken tub looks out to the back garden. There is an additional guest bathroom downstairs. There are two other upstairs bedrooms, one with twin beds and one with a queen bed with a terrace with lovely panoramic town/church view. There is an additional new marble bathroom with Kohler tub upstairs. The wide staircase leads up to the upstairs terrace with wonderful views. A separate laundry room with washer and dryer is located in a small casita. The open design living space flows from the sunny dining room with stained glass windows into the living room area which is equipped with TV, wireless internet, etc. and opens to the garden. The very large outdoor garden can be seen from all the upstairs and downstairs rooms. The house is located in the pretty area of San Antonio several blocks from the Instituto Allende and short walk to Rosewood Hotel which has a spectacular rooftop bar. It is a fairly flat stroll into the main Jardin (Garden square) and Parroquia (main catherdral) along main streets where you will enjoy wonderful restaurants, art galleries, and local craft filled shops. Wonderful outdoor natural hot springs, swimming, hiking, classes, organic market are nearby. San Miguel is of course full of wonderful artistic opportunities, take a class in just about anything creative, do yoga in garden courtyards, take a garden tour, a jewelry or painting class, go to an art opening almost daily or just relax in a cafe on the main square one of my favorites). My family has been a part of San Miguel for close to 50 years, through artist father who was one of the original North American painters to settle here. His work is widely collected in musuems and books/catalogues about him. A number of his works are in the home along with other well know San Miguel artists. I designed the house as I planned to visit often and invite friends and have a home base there. San Miguel is a great place for a celebration or rejuvenation. The people are warm and friendly with people of all ages. I go there when I need to recharge or reflect or just get a blast of wonderful sunshine and warmth. The house has a colorful Mexican feel, and with assistance of my very talented architect sister along with a Mexican architect, it also has the light-filled and open feel and amenities that North Americans enjoy. We hope you love San Miguel and stay as much as we do. I love this location as it is in town and walkable everywhere, but is away from the noisy busy streets, The very large garden is a real plus, to be able to lounge and read, watch the humming birds, listen to the fountain, peaceful. Restaurants can be found as close as a block away. Nice stroll to the main shopping streets and main square. As soon as visitors get to the home they say they feel relaxed and enjoy the special large garden which is unusual in the central zone within walking distance to the main square. Easy relatively flat walk to main square. Beautiful views of the town from most rooms, churches (including the parroquia in the main square), birds flying, hills in distance. Lovely! lovely views of surrounding hills. housekeeper does dishes. dishwasher if want to do own dishes. lovely large garden with trees and flowers. multiple areas to relax in lounge chairs and literally smell the roses, listen to fountain and watch the hummingbirds. Large lawn for kids to run around. Pergola covered patio overlooks lovely large garden with fountain and many trees & flowers. upstairs another pergola covered terrace w amazing views. another terrace for upstairs bedrooms. Wonderful! Make sure you visit the nearby hot springs and vineyards with restaurants. Fabulous restaurants with views in town. My husband, an artist, and I, a gardener; found the perfect place to rent in San Miguel this winter. The house was built by an artist and his family and is full of paintings and beautiful art in every room. It has high ceilings and large open spaces that are flooded with sunlight all day long. The windows and doors open onto a large porch with a handsome pergola that overlook a sumptuous garden full of roses, birds of paradise and bougainvillea. My husband and I spent long hours painting and doing yoga in the garden. We love San Miguel de Allende and spent long days walking the streets and taking in all the festivals and celebrations, but we were always happy to open the gates to the house and enter this garden paradise. The house has two large bedrooms with ensuite large bathrooms and another smaller bedroom with a bath next to it. We traveled with friends and found that we had plenty of privacy with one couple on the second floor and one on the first floor. The owner, Wanda, was very considerate and answered all of our questions before we arrived. When we arrived she was spending some time in her studio, and it was helpful to have her nearby to help us with information about San Miguel. She was very respectful of our privacy but very welcoming. We appreciated the care we received from Norma, who cleaned the house three times a week and was so patient with our limited Spanish. Sergio kept the garden looking like a flower conservatory. The house is in a great location--ten minutes from the Institute de Allende and many restaurants and stores. It is just another ten minute walk to the jardin. The neighborhood is a very mixed neighborhood of tourists from the U.S. and Canada and Mexicans. We loved all the small family businesses that were up and down the streets of our neighborhood. We also loved the sounds of the church bells, fireworks, roosters, and musicians on the streets of San Miguel. Would love to return to SMA ! Thank you Ana. So glad you enjoyed it. We are building an additional patio with lovely views of the parroquia and churches that you can enjoy when you come back! Nice house and walking distance to Jardin (and even if you wanted to taxi it’s about $2). Very nice backyard and spacious and there is the nicest and most quiet dog I’ve ever met named Sweetie who lives in the backyard and is taken care of by the gardener. A great house and a great stay. We very much enjoyed our stay. All areas of the house, including three bedrooms, were very nice. The fourth simple little bedroom is located in an outbuilding but within the property security system. We felt very safe. It’s a good 12-15 min stroll to town. This is a gorgeous home within easy walking distance to the town center and all the shops, bars and restaurants. Claudia was very attentive--the day we checked in, there was a torrential downpour and the route Waze selected was unexpectedly closed. Claudia came out in the rainstorm on foot to find us and lead us in. The garden is beautifully manicured, with blooming bougainvilleas and fruit trees throughout. On a nice day, you can sit outside and enjoy the waterfall wall, and on a rainy day you can sit inside the spacious common area and read a book--either one you brought yourself or something from the fascinating collection that Wanda has so graciously made available for guests. San Miguel de Allende is a place where you can sit in an historic, storybook plaza at a sidewalk bar and listen to mariachis, Walk a few blocks and minutes later find yourself sitting on the rooftop of the new Chicago eatery enjoying an authentic, made from scratch deep dish pizza--just look for all the Cubs, Bears, and Blackhawks banners in the entryway to know you've found the right place. However long you plan to stay, the day you leave you'll find yourself wishing you had stayed longer. Thank you so much for your appreciative review. I love the large garden, so glad you enjoyed it as well. It is so peaceful and relaxing. Hope you caught sight of the hummingbirds too. Everything was perfect, the location is really near to SMA´s downtown but far enough to avoid any crowded street during holidays. Inside the house everything is wonderful, comfortable rooms, large bath rooms, nice decorations. My nephews really enjoyed the large garden playing outside.